Four fund winners and two in-kind support winners were announced at the Ideas Summit on Friday 29 March. Bursaries totalling £15,000 were awarded to four outstanding dance creatives, with a further two projects offered in-kind support at the 2019 Ideas Summit, a day-long event on Friday 29 March, hosted by East London Dance at Stratford Circus Arts Centre. The Ideas Summit is the third biennial event offering artists, producers, venues and organisations from East London and beyond the opportunity to share and exchange enterprising ideas in dance. Founded in 2008 by creative artist, Kloé Dean, Myself UK Dance is an all-female Hip Hop dance company based in London. Awarded £4,987.33 and event support by East London Dance to support Myself UK Dance’s 10th anniversary celebration. The project aims to launch an annual platform and discussion, paving the way for new and active female creatives in Hip Hop/Urban Dance to be seen, heard and celebrated equally alongside their male counterparts. Kasia and Ross Truefitt are a husband and wife collective producing shows, running creative workshops, promoting healthy minds and bodies. Awarded £4,980 and one week’s rehearsal space at Studio Wayne McGregor to develop Performance & Dancing Mindfulness workshops that focus on mental health and well-being. The workshops will be delivered to 10 primary schools across east London. Magical Minds provides children with a creative exploration into the human brain and tools to increase their ability to self-regulate their emotions. Scanner’s Inc is a creative company working across the arts to produce incredible performance, pop up events, festivals and social gatherings in theatres, shops and public spaces. Awarded £2,833 and in-kind support from London College of Fashion, UAL, to support a 360-degree performance experience inspired by 37 years of Hip Hop culture in London. The Style Years features BBoys, Fly Girls, Roller Skaters and Funk dancers and tells the story of two boys captivated by Breaking, style and Hip Hop in 1983. Creative artist and choreographer, Michael Simon, is also a contributor to The 8 Club, a new web series from the Young Vic exploring ideas around contemporary masculinity. Awarded £2,200 and introductions to Newham schools by Stratford Circus Arts Centre, to support the development of a first draft script and bespoke music, in preparation for a two-week R&D on a new dance theatre work that will use the biblical story of Cain and Abel to explore topics related to masculinity and knife crime. Uprise Rebel Productions aims to address diversity in the dance sector. 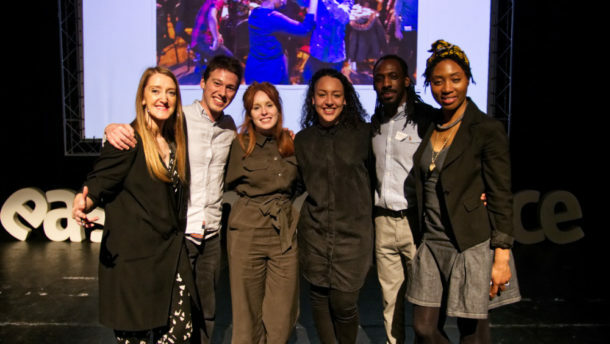 Awarded access to Sadler’s Wells Senior Producing Team to support touring company, Uprise Rebel Productions, as it aims to address the balance of diversity within the dance sector by creating a network of venues that support the development and visibility of work created by black female artists. Joel’s work is a mash-up of athletic movement, subtle everyday gestures, and fantastically bizarre moments of nothingness. Each work he creates is a composition of memories. Awarded access to rehearsal, exhibition and event space and an introduction to Redbridge libraries by Redbridge Drama Centre, to support the rehearsal and production of a pilot event in east London, that focuses on bridging the gap between younger and older generations and making contemporary dance and culture more accessible to an older audience. Each winner will also be given an annual One Dance UK membership. The 15 shortlisted artists and producers were: Anat Cederbaum, Léo Lérus & Tony Nwachukwu; Arunima Kumar (Arunima Kumar Dance Company); Bex Anson & Dav Bernard (MHz Scenography); Charlotte Edmonds & Elizabeth Pick; Claire Hough; Grace Okereke; Joel O’Donoghue (Joel O’Donoghue Company); Kasia Truefitt (A Truefitt Collective); Kate Scanlan (Scanners Inc); Kloé Dean (Myself UK Dance); Kristina Walsh; Lucy McCrudden (Dance Mama); Michael Simon; Patrick Collier (201 Dance Company); Sheena Khanna (Moxie Brawl).